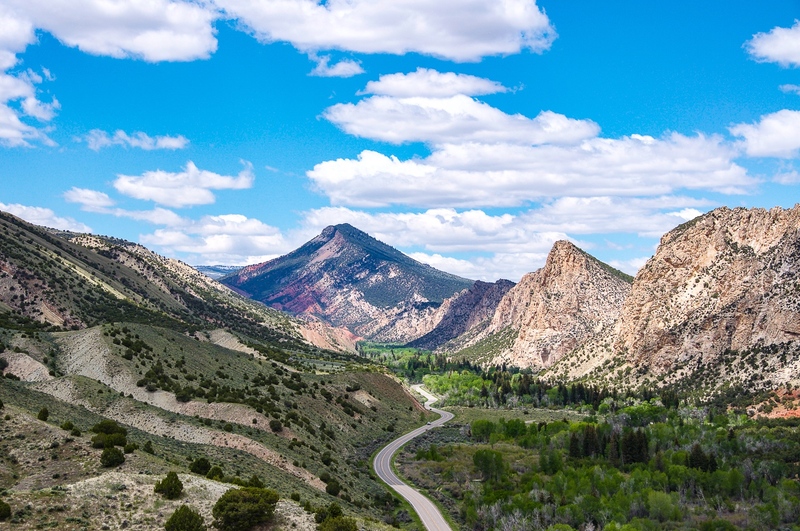 The 730-mile Green River, the chief tributary of the mighty Colorado has, over millions of years, created myriad recreational opportunities in northeastern Utah — including spectacularly deep canyons, multi-colored geologic formations, a reservoir, and what’s now a national monument, all of which are accessible from the seat of a road bike. The 120-mile ride (round-trip) along the Flaming Gorge–Uintas National Scenic Byway from Vernal, Utah, near Dinosaur National Monument on the Utah-Colorado border, to tiny Manila near the Wyoming border winds along the edge of the fossil-rich Uinta Mountains and past the colorful Flaming Gorge. Split Mountain Campground, on the banks of the Green River in Dinosaur National Monument, is an optimal starting point. Administered by the National Park Service, it’s open year-round and has water from April through October. It’s just under 20 miles from Split Mountain to the outskirts of Vernal, which means you’ll have plenty of time to make a stop at the Fossil Discovery Trail, a one-mile hike past countless fossilized dinosaur bones from the Quarry Visitor Center. 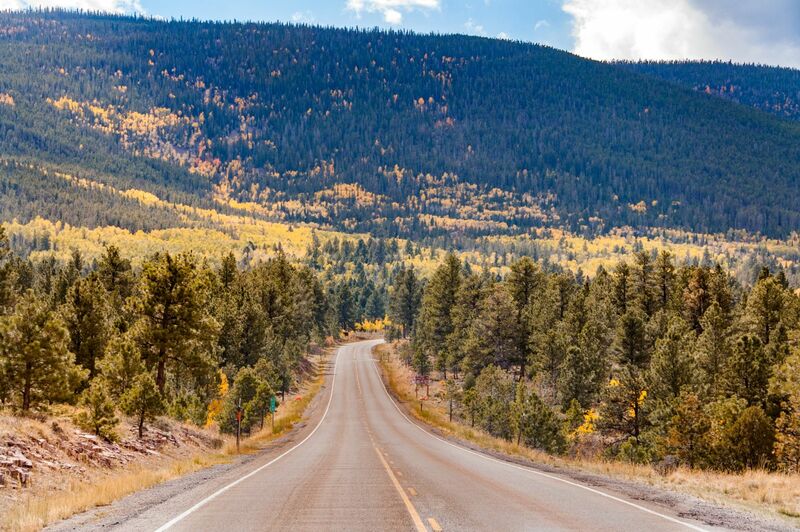 From the Vernal area, head north on Highway 191, also known as the Flaming Gorge–Uintas National Scenic Byway. The road is remarkably well marked with geological info signs nearly every 100 yards — and much easier to read from a bicycle. After nine miles take the turnoff for Red Fleet State Park — there’s some shoulder most of the way, though cyclists should be ready to ride in traffic on this popular route. Make camp at Red Fleet, either in your own tent or in one of the park’s teepees. A 1.5-mile hike takes visitors past dinosaur tracks, best viewed in the late afternoon — or, if you prefer to rest your legs, rent a canoe, kayak, or SUP by the hour to explore the Red Fleet Reservoir. In the morning, ride the two miles back out to Highway 191, and head north toward Red Canyon. This section contains the steepest and most prolonged climbs on the route — you’ll gain nearly 2,600 feet over 10 miles right out of the gate, some of it at grades as steep as 9 percent. At around mile 17 on U.S. 191, the sagebrush flats turn to pinyon and juniper. A few miles farther and this has become an alpine drive, with aspen the predominant roadside tree. The Uintah/Daggett county line is the high point of this drive at 8,428 feet. From there, you'll enjoy mostly cruiser downhill. You'll enter the Flaming Gorge National Recreation Area after a total of 33 miles north of Vernal, or about 24 miles from Red Fleet. It's then 1.5 miles to the junction where ultimately you'll head west along S.R. 44 and the continuation of the scenic byway. For a scenic detour, veer right, staying on 191. There's an interesting stop at Firefighters Memorial Campground, which was dedicated to three firefighters killed in the 1977 Cart Creek Fire. Stretch your legs with an easy three-mile hike on the Bear Canyon Trail, which leads to stunning views of Flaming Gorge, or continue a few miles to the dam and visitor center or further to Dutch John (population 145) if you want to stock up on fishing supplies. From the junction, it's about 6 miles to the dam or 8.5 miles to Dutch John. Back at the junction, it's about 34 miles to Manila, near the Utah-Wyoming border along state Route 44. Much of this section runs along the iconic centerpiece of this highway and a marquee destination of your ride: Flaming Gorge, so named by John Wesley Powell’s 1869 expedition for its brilliant red cliffs — which, in the right light, almost appear to be on fire. Today, a reservoir of the same name, created by the 1964 damming of the Green River, stretches 91 miles upriver into southern Wyoming. About 3 miles past this intersection is the turnoff on the right for Red Canyon Overlook. Along the overlook road is Red Canyon Lodge, campgrounds, a visitor center, and picnic area. It is 3 miles to the overlook. Why make the short detour? Red Canyon Overlook presents probably the most spectacular view of the reservoir. From 1,700 feet above the reservoir, the water appears in deep green hues. And that 1,700 feet is straight down, with the cliffs below the overlook almost perfectly vertical. The dam, the reservoir, and the gorge itself are all part of Flaming Gorge National Recreation Area. The Lucerne Campground, on the shores of the reservoir at 6,100 feet, has incredible views and great fishing access. Though Manila is a small town, there are a few restaurants and a small grocery store. If you haven't arranged a shuttle, you can overnight here or at forest campgrounds like Red Springs and Lodgepole along S.R. 44. Or, you can stock up for the return journey. Thank you for visiting http://www.flaminggorgecountry.com/cycling-flaming-gorge! Be sure and revisit flaminggorgecountry.com frequently for content updates and more.